Featuring QSC K.2 Series active speakers with a Yamaha MG12XUK mixer. When you need power, portability and convenience in one complete system, these PA packages are the perfect place to start. We’ve done all the work for you and hand-selected the components for optimum performance, so each package has everything you need to be geared up and stage-ready in a snap. All you need to do is decide what size powered speaker suits you best. 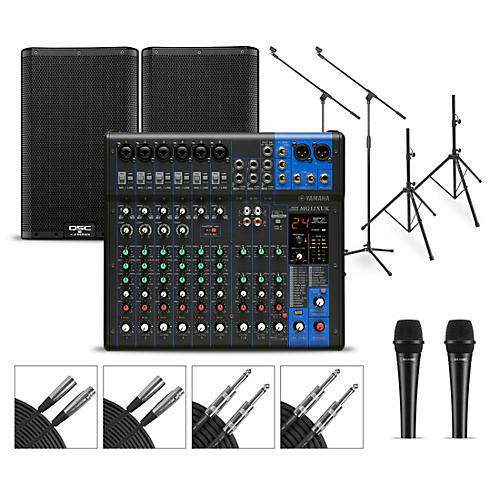 Taking center stage in each package is Yamaha’s versatile and rugged MG12XUK 12-channel mixer. With smooth rotary knob faders for a more compact design, the 12-channel MG12XUK carries on Yamaha's tradition of great sound, delivering Class-A D-PRE microphone preamps and SPX onboard effects. Ideal for recording, live music and installed applications, the MG12XUK boasts an intuitive, easy-to-use interface and rock-solid construction that's designed to stand up to professional use. With a redesigned Class D power module that delivers nearly twice the power to its LF drivers compared to its predecessor, the K.2 Series pumps out 1,012 watts of continuous power (2,000W peak) for improved performance across the lineup. Onboard DSP with 11 factory-preset EQ profiles ensure flawless sound with tight, deep lows with accurate mids and clean highs in any setting. Consisting of 8 in., 10 in. and 12 in. 2-way models, the K.2 Series lives up to QSC’s legendary workmanship and reliability. Get gig-ready with this convenient PA package—order today.